The legendary whodunit The Mousetrap, from Queen of Crime, Dame Agatha Christie, will play Sunderland Empire next week – and you could be there for free. We have a pair of tickets to give away for opening night on February 28. This West End hit has been entertaining theatregoers for 67 years with its macabre murder mystery. This new tour stars Only Fools and Horses and EastEnders actress Gwyneth Strong as Mrs Doyle. 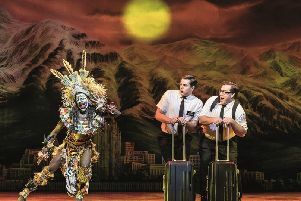 Speaking about appearing in the touring version of such an iconic show, she said: “Opportunities like this come out of the blue and I was really delighted to be asked to be a part of the show. The touring cast also includes David Alcock (Mr Paravicini), Geoff Arnold (Detective Sgt Trotter), Nick Biadon (Giles Ralston), Lewis Chandler (Christopher Wren), John Griffiths (Major Metcalf), Harriett Hare (Mollie Ralston) and Saskia Vaigncourt-Strallen (Miss Casewell). l The Mousetrap is at Sunderland Empire from February 28 to March 2. Tickets from Tel. 0844 871 3022 or www.ATGtickets.com/Sunderland. l To be in with a chance of winning a pair of tickets to opening night on Thursday, February 28, complete the title of another famous Agatha Christie novel, Murder on the Orient ...? Email your answer, along with your name and daytime contact details, to Katy.Wheeler@jpimedia.co.uk by noon on Monday, February 25.